Easy peasy, but FAST mailing time! 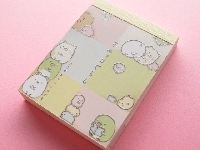 20 brand name kawaii mini memos (2X3 inch) in an envelope sent to your eager partner. DO make sure your memos are inside something as they tend to get bent/dented when left to run around an envelope unsupervised. Do I make like random mini memo packs of 20 for my partner? Lol I'm new but I buy these kawaii memo padsall the time!